UPDATED: Sky introduces 1TB high-definition set-top box | What Hi-Fi? We've just had it confirmed that the new Sky 1TB HD box will be equipped with the same HDMI connection as the current HD boxes (not HDMI 1.4), and will still need a coaxial or optical digital connection to feed surround sound to a multichannel amp or receiver. Gerry O'Sullivan, Sky's director of strategic product development, told whathifi.com: "We'd like to add HDMI 1.4 and it's something that we're looking at, but we'd have to work with every TV manufacturer to ensure consistent standards of performance. If it does happen, it won't be as a retro-fit on existing boxes." All Sky's existing HD boxes, and the new 1TB model, are 3D compatible. Yesterday the news was all about Apple, today it's all about Sky. 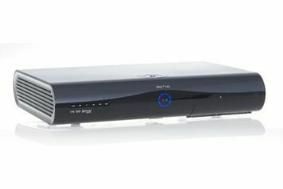 Following the announcement that it will launch its 3D TV service in April, Sky has also revealed its new 1TB high-definition set-top box. It can record up to 240 hours of HD programmes, is 3D compatible and is available from today (January 28th) for £249. Installation costs £30 for new customers and £60 for exisiting customers. The new box offers all the benefits of a standard Sky+ HD box, including access to Sky's 37 HD channels, the new HD Sky Guide, Sky+ and Sky Anytime, but with four times the storage capacity. This means it can store around 100 HD films or 740 hours of standard-definition content. At the same time, Sky Anytime is increasing its memory size to allow for up to 160 hours of HD content to be viewed on demand. "The Sky+ HD 1TB box will appeal to people who want to watch and store even more HD TV," says Hilary Perchard, Sky's director of product management and marketing. The existing Sky+ HD box will now become its standard set-top box. New customers who sign up for Sky's HD service will get the box for free. Customers not upgrading to the HD service will have to pay £49 for the standard Sky+ HD box. In a separate announcement, Sky has revealed a 30 per cent rise in half-yearly profits, driven by the growing popularity of its high-definition TV service. It made a pre-tax profit of £358m in the six months to December 2009, up from £276m a year before. Sky says it added 482,000 new customers to its Sky+ HD service in the last quarter of 2009. It now has a total customer base of 9.7 million people.